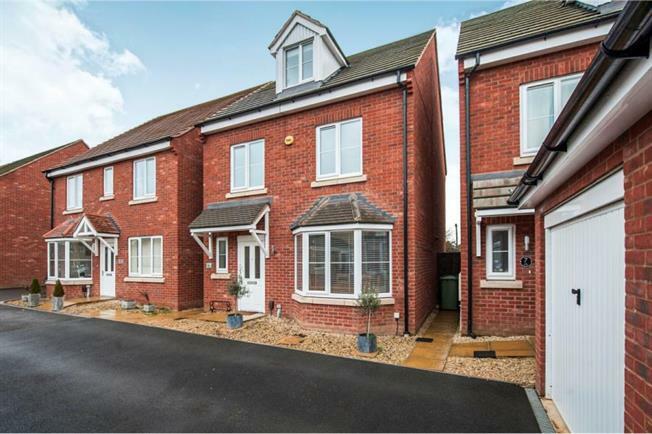 4 Bedroom Detached House For Sale in Gloucester for Offers in excess of £300,000. A well presented four double bedroom detached property set in the sought after Hardwicke area. The property is part of a small development of only seven properties. The accommodation comprises entrance hall, stunning kitchen dinning with the added benefit of water filter and food waste disposal systems. Under stairs cupboard, utility cupboard and 17ft lounge with French door to the rear garden. On the first floor is the master bedroom with fitted double wardrobe and en-suite shower room, bedroom two a large double room and airing cupboard. The second floor has family bathroom and two further double bedrooms both with fitted double wardrobes. Further benefits to the property are enclosed private rear garden with gated access to the side, garage to the front of the property with two parking spaces.